In this window, fill in the total amount of cash for the refund / withdrawal. The Total amount can be filled in the "Total Amount" field. 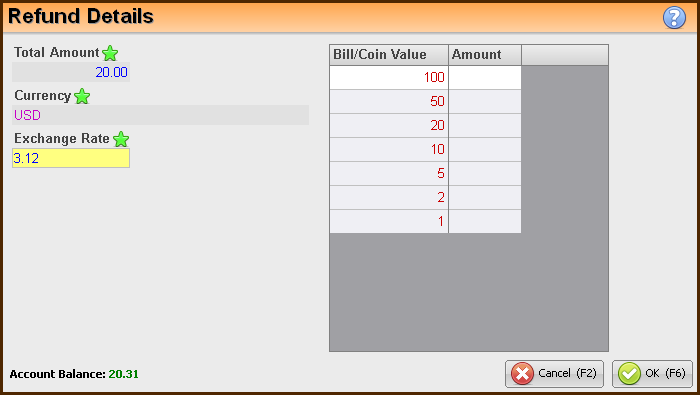 Alternatively, fill in the received amount of bills/coins next to its value, in the displayed table. At the bottom of this window, the current account balance will be displayed. The Refund / Withdrawal cash UI can be defined in the bookkeeping tab of the System Fundamentals. Select the required UI from the list of the "Receipt / Refund Cash UI" field.